Today I will compare two Bluetooth speakers, JBL Charge 3 and its larger brother JBL Xtreme. Let’s check which of them is better by comparing design, sound, battery, etc. The immediate first impression I had is the quality of the device itself. It very well made. 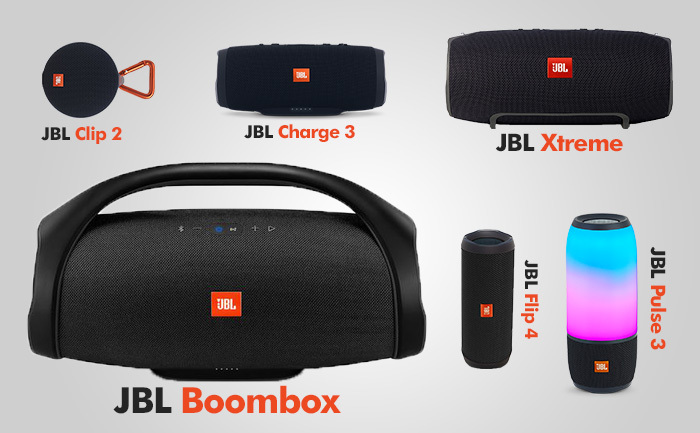 It’s a mix of durable fabric, hard rubber on both sides of the speaker, and the JBL logo on the front. Both models have the same number of buttons located on the top. The JBL connect button allows you to connect and sync multiple JBL speakers, all playing at the same time. At the bottom-front of the speakers, there are LED lights which have two functions. They indicate how much battery life is left, or, when the device is plugged in, the charging status. Charge 3 is IPX7 certified. It means you can hold it submerged up to 1 m for 30 minutes and it will still play. Because the device is waterproof, all ports are hidden behind the thick rubber door. You can orient the speaker horizontally or vertically. The drivers are not 360 degrees, so be sure that the JBL logo is pointing in your direction. Xtreme is much bigger and heavier than Charge 3. It’s still Bluetooth and portable, but it’s not as easy to transport as Charge 3. For that reason, JBL included a carrying strap that you attach to both sides of the speaker and wear it as a bag. Contrary to Charge 3, it’s not waterproof, but at least you don’t have to worry about rain or spills. You can even clean it under running water. Now, let’s take a look at the bottom of the speaker. Here, you will find the rubber feet to prevent the speaker from moving around. Access to connections is different than it is in Charge 3. 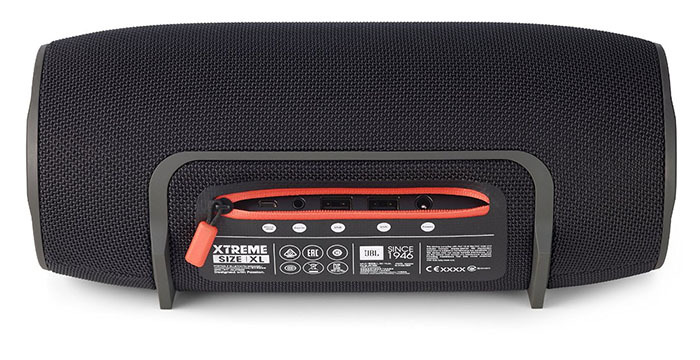 Because the speaker is not waterproof, there is no need to use thick rubber door – in JBL Xtreme the connections are behind the orange zipper. It can be a little hard to get to them for the very first time, but after a while, it will loosen a bit making the access much easier. In JBL Xtreme you will find five ports. Charge 3 is a big improvement over Charge 2, especially when it comes to loudness. But still, it doesn’t sound as good as Xtreme. The bigger model has better treble and bass, and the sound is even louder. What is interesting is how the bass is boosted in these JBL speakers. Both models use a technology called passive radiators. Passive radiators are speakers without a coil or magnet, which are responsible for creating a better bass. If you want to learn more about passive radiators, check the video made by Definitive Technology. Charge 3 has two 10 watts, 50-millimeter front-facing drivers that sound great, even outdoors. It has a punchy bass, clear mids, and crisp highs. But if you crank up the volume level the bass can get a bit harsh. When we talk about speakers sound, bigger is usually better. And the size is a big advantage of JBL Xtreme. Low frequencies responsible for bass are better in Charge 3 (at least on the paper), but after listening to both of them, in my opinion, bass on Xtreme is richer and deeper than on Charge 3, providing more immersion into each song and movie that I’ve tested. The disadvantage of a single speaker is that the drivers are very close to each other, so there won’t be a good stereo separation. It definitely won’t be a competition for your bookshelf speakers. Charge 3 offers a 6000 mAh battery that will last about 20 hours and Xtreme offers 10000 mAh and 15 hours of listening. The great feature in both devices is that if your smartphone is out of juice, you can always use your speaker as a power bank and charge it with a USB cable – a great feature if you are on vacation and don’t have additional power bank or solar battery charger. Pairing the devices is very easy and convenient, just press the Bluetooth button, and after a while, it will be listed on your phone. The speaker will automatically connect if it is within the range of a phone. A maximum of three devices can be paired with the speaker. I didn’t notice any problems with the connectivity. The music was never interrupted and the Bluetooth range is amazing. You can have your smartphone a few rooms away and there will be no music drops or disruptions. PROS: Volume level / Battery life / Midrange / IPX7 waterproof / JBL Connect / Small and portable / Power bank / Sturdy / 3.5 mm input jack / LED indicators. PROS: Volume level / Battery life / Splash resistant / JBL Connect / Power bank / Sturdy / 3.5 mm input jack / LED indicators. CONS: No SD card slot. CONS: Heavy / No SD card slot / not waterproof. Due to speakers water resistance and a big battery, they are versatile enough to be used in many different environments, like bathroom, living room or outdoor, even at the pool or beach at almost any weather conditions. Choose Charge 3 if I want to travel with your backpack and Xtreme when you listen to music at home or outdoors.